We absolutely loved this campground! Beautiful, peaceful setting with great sites and facilities. What a plus that it's in such a wonderful area and close to Quebec City with a shuttle to the ferry! Very nice place lots of seasonal campers. friendly staff, wifi was only $2.75 and we were both on. Garbage cans were very full (we stayed Saturday night). some highway noise. Small general store with fresh vegetables and baking just 4k down the road. Nice clean campground with very friendly staff. Many permanents, but very well landscaped and clean. It was a little tight making a few turns in our 44' motorhome, but not a major problem, you are escorted to your site. Large, grass spaces. They do charge for wifi which we did not pay because when we got parked I checked and the reception didn't look very strong so we just used our phone data. It's about 40 minutes to drive in to Old Quebec City, but worth the drive. It was in August 2015. Super location, staff was super. Clean and well maintained. The shuttle service for the ferry to Quebec City was very convenient as it was during the New France festival. We were on a New England color tour and also wanted to see old Quebec City. It is a nice campground, although not as many trees as some. There are a lot of permanent campers here. The staff were very friendly and helpful. Among the highlights of the stay were the free shuttle to the ferry across the St. Lawrence River into Quebec City, the staff booked our tours in Quebec City for us, and they timed the shuttle trips so we could make our ferry and tours. This is a French speaking area of Canada, but they spoke English well. We did not use any of the restroom or shower facilities and were there after the pool was closed. We would certainly stay here again if in the area and highly recommend this campground. 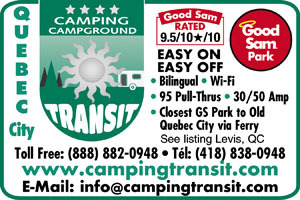 This campground is along side AutoRoute 20. Our site was 196 and we were right along side the highway. Very loud traffic noise!!! Request not to be at the end of the campground. Aside from that the campground was very convenient to get to. We had a level pull thru site where the hookups were positioned in the middle of the site and easy to access. We had a good amount of space between sites. The tower had a weird set-up where the faucet was really close to the power source. So close I was not able to plug in my surge protector. The power seemed to be fine as was the water pressure. The internet was sporadic at best. The rest of the campground was clean. They have a nice pool to cool down in, and a variety of recreation hall, etc. There is a small store and restaurant on property. They also offer a free shuttle to the ferry into Quebec City. We found it was just easier to drive to the ferry and pay for parking than be tied to their schedule. Staff very helpful and welcoming. Site well maintained with many useful services. The pool was during our stay 76F and 90F for the Spa. Be aware: the noise from the highway with heavy traffic is a bit disturbing all over the campsite. Also you are far from downtown Levis and Québec City. No walking trails or bike paths directly accessible from the campsite. Very nice campground. Convenient to Old Quebec. The owners family is extremely helpful and accommodating. Little cafe has good pizza! Had a large pull-thru Highly recommend! 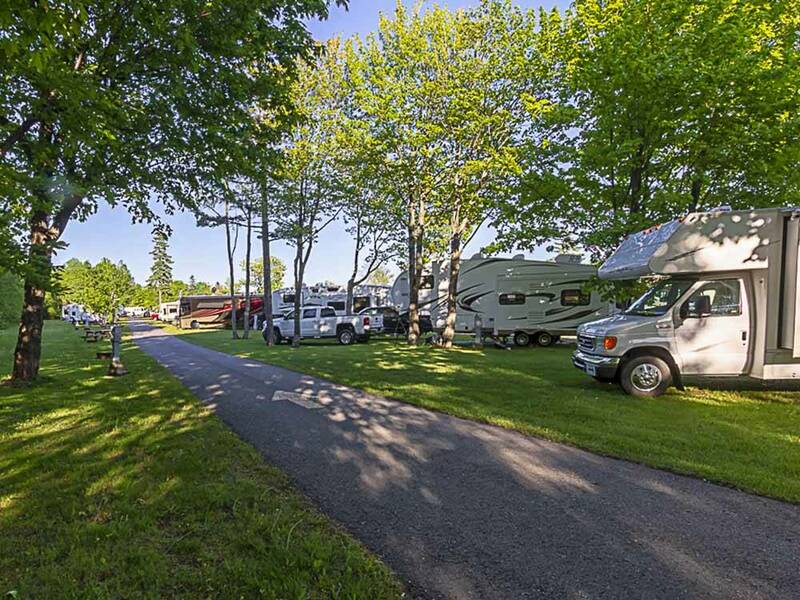 very welcoming owner, very nice campground, clean, quiet. I recommend it to all if you want to visit the Québec region and more.